The 18.30-carat Shepard Diamond is from South Africa, it was acquired by the Smithsonian Museum by exchange for a collection of small diamonds that had been seized as smuggled goods by the United States Customs Service and is named for the Smithsonian employee who helped facilitate the transaction. 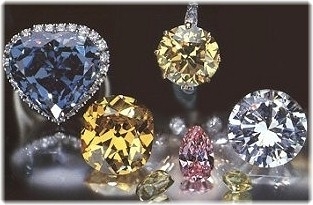 The Shepard Diamond amoung other diamonds in the Smithsonian's collection. 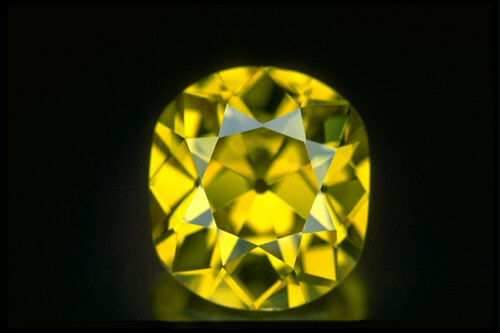 The round yellow diamond in the back weighs about 12 carats. The blue heart-shaped stone is the Blue Heart Diamond, weighing 30.82 carats. The round brilliant white diamond is the Pearson Diamond, weighing 16.72 carats. The pink pear shape, named the De Young Pink, weighs 2.86 carats, and the two uncut green diamonds weigh 2.05 and 0.97 carats.